“I love that you have flowers on your grocery list,” the nutritionist I’d been seeing said smiling as she looked over my list from my last trip to Trader Joe’s. “Well, I always buy flowers,” I say, somewhat shyly but also with a bit of pride. I didn’t always buy flowers. I mostly bought them when we were entertaining in our small Brooklyn apartment. It was often one of my husband’s chores to run out to the corner store and choose some flowers as I feverishly cleaned and got everything else ready to impress my guests. I had a hard time deciding on a type of flower myself and would often defer to him even if we were together at the flower shop. Besides the entertaining, he also bought me flowers quite often, and in fact, the day before he died, I had just tossed the last bouquet that he bought me before he left for his trip. I realized and regretted that right away. The last bouquet. They must have started to look sad because I always used to tell him, and he rather liked it, “Nothing can brighten a room like fresh flowers, and nothing is more depressing in a room than dying, wilting flowers.” I can still see him outside our apartment windows, his silhouette getting off the bus and holding the flowers. I think he had done something “wrong,” and so I half expected them. Still, I had smiled to myself when I saw him carrying the white paper cone in one hand. They were pink carnations I think- or white maybe, with darker pink streaks through them. It does get hard to remember. Afterwards, I set up a memorial of sorts on the same table, spreading out all of the photos from the funeral in the black IKEA frames friends had bought for that purpose, and buying fresh flowers each week from the Whole Foods I walked to along the Hudson River. It seems extravagant that I bought flowers as a newly widowed young mother with no source of income, and maybe it was- extravagant yet vital. After putting my toddler to bed, I often stood before all the frames and flowers in the dark living room at night, shadows from the busy street outside running past, and said goodnight to him. Later, when I changed the apartment around and it consisted mostly of play spaces for my daughter, I no longer kept all the photos in that spot, but I kept buying the flowers. If we visited the cemetery, even if we went to buy fresh flowers as well, I pulled out a few from our own present bouquet to leave there, so that when we got home later, I could look at our bouquet and know that a few of those same flowers were there – with him. Years before, while working in a cubicle at a publishing job that sucked the life out of me, I had discovered that flowers were transformative. One morning, while walking my usual route from the subway at Union Square up to my building, I stopped to admire the pink peonies they were selling outside a small market. On impulse, I was compelled to buy them and brought their softness and life into my cubicle of buzzing fluorescent light and stale air. I felt a lightness and refreshment that entire day that I never forgot. “We need to feed our souls, too,” his wife had replied. 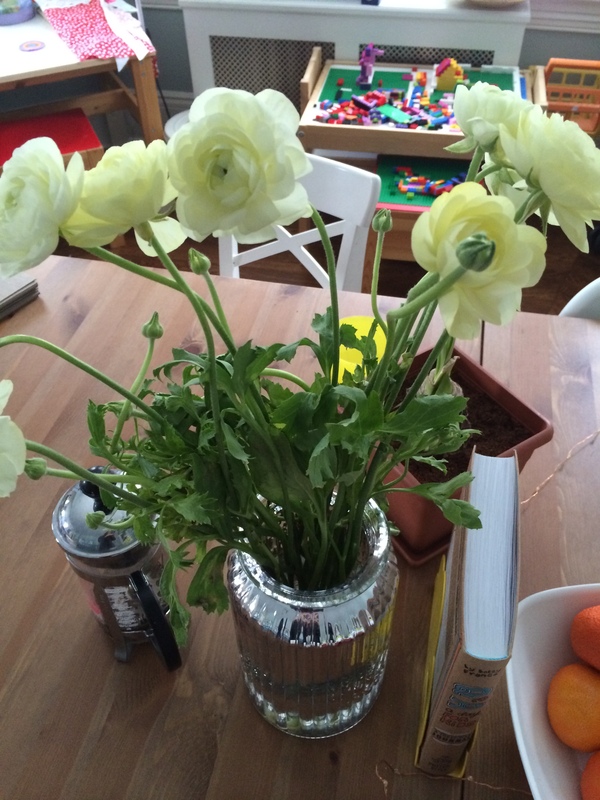 This morning there are some lovely white ranunculus with a hint of pale green coloring, my current favorite flower, offered at my weekly trip to Trader Joe’s- beauty I gently place in the front of my shopping cart. Beauty for $5.99. 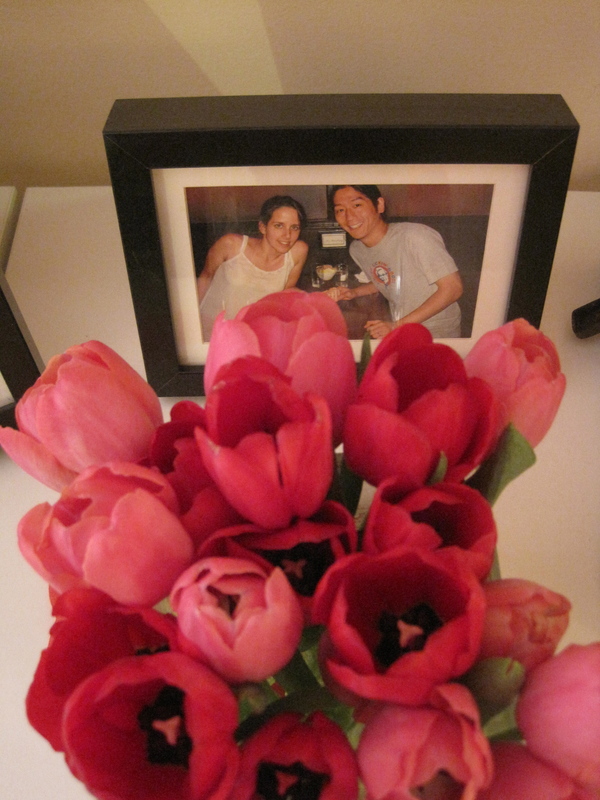 (Yes, Trader Joe’s has great prices on flowers.) As I bring them inside my house, unload the groceries, and find a vase for them, this post occurs to me. The quotes and ideas form like bullet points in my mind, and I jot them down. Feeding my soul for $5.99. Makoto painted his bouquet. I write about mine. It’s as though they possess an inherent creative energy that counteracts any destructive energy. And tonight, as I write, I decide to look through iphoto to find a few photos of the flowers I’ve had over the last few years. I am sure that I have at least a few, but I am shocked at how many I find. They are not staged like a still life from the pages of Real Simple. They are snapped quickly with my phone mostly, sometimes out of focus, and sometimes surrounded by the usual clutter of daily life- Legos, books, snacks. I suppose when you see something beautiful, you want to take a photo of it. Now that I’m sketching, I often find myself sitting at the dining room table sketching them and painting them with watercolors. I sift through the months of the past four years on iphoto- from the raw, early days of grief and through each season: pink and red tulips for Valentine’s day, daffodils in late February or March to cheer on spring as winter gets long, sunflowers in September, white hydrangeas I pair with red berries for Christmas, snap peas, irises, roses- and I find what I really have is a journal of flowers. The backgrounds change as we move from one apartment to another, as my daughter grows from a toddler to a six-year old girl. The flowers have comforted me, and now they comfort me again. I feel a strange sense of pride reviewing it- evidence that I have held it together better than I thought. My life fell apart around me, but there were flowers on the table. “I want Audrey to feel beauty and good things about this world,” my husband had written in an email a few weeks before he died. The flowers help. Seeing that I bought them, displayed them, and photographed them- assures me that hope has been here all along- sometimes in a simple bowl or small glass vase, humble and often in the background- but also steadfast and striking. To see the rest of her photos, go here.